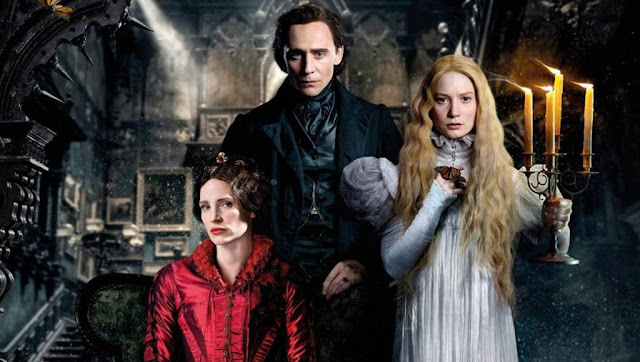 Certainly after its initial release and then subsequent releases, Crimson Peak was a movie brought down by its own marketing. But then again, it was always going to be a hard movie to sell. Sold as haunted house movie, it is actually an R rated romance movie geared towards the sensibilities of bookish fourteen year-old girls, well, that was how director Guillermo Del Toro put it in an interview concerning his film. In the same vein as his other spooky outing, The Devil's Backbone, the ghosts and apparitions here represent sins of the past, just shown here on a familial scale rather than a national one. But the ghosts are more tragic than they are terrifying, which does, on the one hand, fits the swooning gothic setting. But on the other, it means that the scariest, if you can call them that, scenes are featured at the beginning, followed by diminished thrills afterwards. Mia Wasikowska stars as the aspiring author, Edith Cushing, who is described as, 'our very own Jane Austin', at one point in the movie. While she is typing up one of her stories in her father's office, she comes face to face with Thomas Sharpe, played by Tom Hiddleston, an English Baronet who retains his ancestral title, if not the fortune. Although she is more fond of writing than dancing, Edith quickly falls for Thomas and he and his sister, Lucille quickly wriggle themselves into the Cushing's social circle. It doesn't take Thomas long to propose to Edith and he whisks her away to his English home, Allerdale Hall. There, she quickly has to learn to deal with the ghosts in the home and the hatred from the thin-lipped Lucille. Jessica Chastain's, who plays Lucille, performance - ice cold, unblinking and perpetually teetering on the edge of true insanity - is a particular highlight. And because of her powerful performance, the others from the main cast can't match Chastain's intensity, despite writer Matthew Robbinson and Del Toro's attempts to keep Wasikiwska as an inverted version of the damsel in distress stereotype. But like so many of the themes of this movie, it is so focused on, it comes across as overwritten and the script is full of foreshadowing of the psychosexual twist that many of the viewers will have no doubt seen coming.